Members of the Savannah Chapter of The Links, Inc. are pictured with Rosalind Hollis (seated, left) who received her 25-year certificate during the Southern Area Conference. 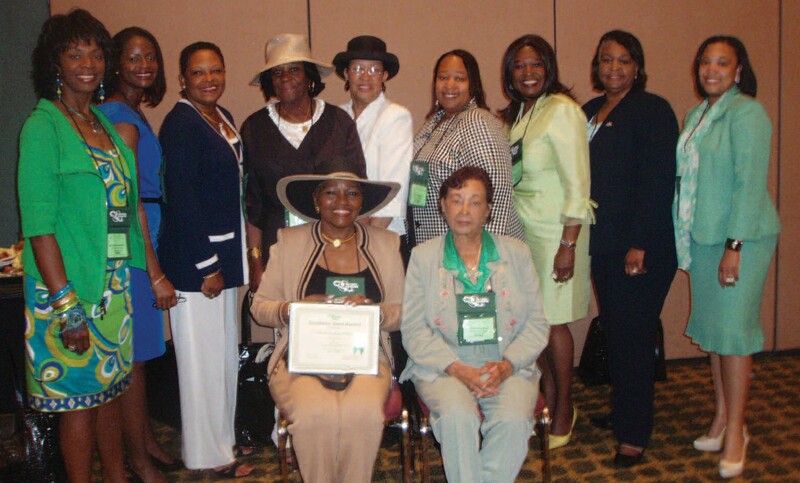 The 40th Southern Area Conference of The Links, Incorporated was held May 13-17, 2009. The four day event took place at the Hyatt Regency Jacksonville Riverfront, in Jacksonville, Florida. Members of The Bold City (FL) Chapter were perfect hostesses delivering southern hospitality with flair and finesse. The Savannah Chapter was well represented with twenty members in attendance. The conference started with the membership attending both programmatic and operational workshops. Programmatic workshops served to enhance the knowledge base of planning and executing effective chapter programs in the areas of the arts, health (childhood obesity), and literacy. Operational workshops allowed the membership to fine tune individual skills that collectively will continue the advancement of our chapters. One of the conference highlights for the Savannah Chapter was Link Denise Cooper continuing her quest as a Scott Hawkins Leadership Institute Fellow. Another conference highlight was The Friendship Breakfast where Links Deanna Cross, Rosalind Hollis and Dorothy Law were honored for reaching the milestone of twenty-five years in Linkdom. Link Rosalind Hollis was in attendance to receive her award. The conference closed with Links, Connecting Links and Heir-o-Links celebrating a successful conference at The White Rose Banquet. Link Marie Currie was installed for her second term as Southern Area Director. The Links, Inc. next gathering of its membership will be in June of 2010 at the National Assembly in Detroit, Michigan. Virginia A. Edwards serves as chapter president, Laura N. Wiggins serves as Chair of Communications & Public Relations.